If you’re the proud owner of a Ninja blender, then you know that these blenders are well worth the money. With the features these blenders offer, not to mention the overall quality of their construction, they are a fine addition to any well-supplied kitchen and should offer you years and years of enjoyment and service. But, like anything, these blenders also require a little bit of maintenance on your end. It doesn’t matter how well an appliance is built if the owner doesn’t take care of it from time to time. And with a blender, “taking care of it” means thoroughly washing the blender after each and every use. Why is this important? Well, aside from the obvious gross-out factor that comes from old, disgusting food particles being left on the blender, a dirty blender also will not last as long, as food particles and other contaminants can lead to rusting and other early wear and tear. The good news? Cleaning your Ninja blender is not difficult at all, and will add years to its life! Believe it or not, that’s it. The great thing about cleaning your blender is that, not only is it easy, but it doesn’t really require any special tools or knowledge to do this successfully. Now that we have our materials gathered, let’s get to washing! Using the dishwasher to clean your blender probably seems like a no-brainer, and there’s good reason for that. It’s easy, convenient, and in most cases you end up with a thorough clean. While there are some advantages to using the dishwasher, the disadvantage is that this is by far the slowest of the methods. Regardless, to use the method you just follow some very simple steps. First, you need to disassemble your blender. Most models of blenders come apart into four separate parts: the lid, the container, the blades and the base. Three of those parts — lid, container, blades — can go in the dishwasher. Once the blender is taken apart, just place the pieces in there like you would any other dirty dish. Once placed, select the cycle, and then you are free to go about your business until the dishwasher is finished. When the dishwasher is finished, just put the pieces back together and store it for the next use. Out of these three methods, this is by far the most labor-intensive way to clean your blender, but it’s a good way to make sure everything is clean and ready to go. What’s more, this is a much quicker way to clean your blender than the dishwasher. First, take the blender apart into the pieces, just like I mentioned above. Then, get your favorite dishwashing soap and sponge and apply a little elbow grease. This is fairly straight-forward, and one of the great things about doing it by hand is that you can easily see what parts need to be cleaned until the whole thing sparkles. The only thing to worry about in this case is that set of blades — when cleaning those, make sure to use slow and deliberate strokes so you don’t accidentally cut yourself. When the cleaning is finished, you can let them dry naturally on a towel, or dry them by hand. Either way, your blender is ready for the next use! So, your blender probably didn’t come with a “self-cleaning” button, but that’s no matter — a blender can easily clean itself. And you don’t even need to disassemble it! To use this method, all you have to do is put a few drops of your dishwashing liquid in the blender, along with a cup or so of water (make sure it’s been rinsed out and the worst of the remnants have been rinsed away). Then, turn your blender on. You can experiment with times and speeds, but generally it’s a good idea to keep it going for a minute or two at a medium speed, at least. Once finished, you’ll need to rinse out the blender with some warm water to get the soap out, and then give it a visual inspection to make sure it’s clean through and through. Then, just let it dry by hand before putting it away. 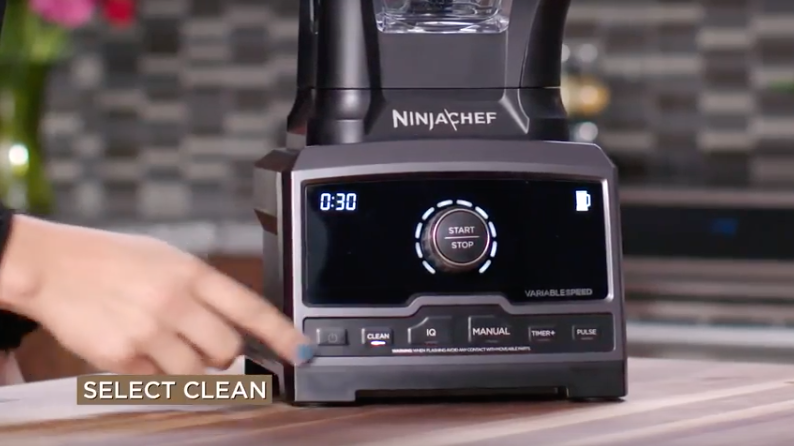 We hoped you enjoyed this tutorial and were able to learn how to easily clean your Ninja blender. Remember — a clean blender not only keeps your food and drink healthier, but it will also last longer. So, make sure to clean your blender after every use! Do you have any other ways to clean your blender? Leave us a note in the comments!